Kit just gave birth to a little heifer. This morning, we noticed that we were down a head at the bale ring. 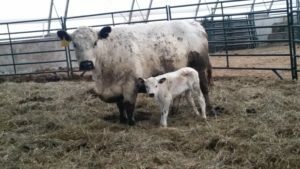 When we checked the barn, there she was — Kit with her sweet little calf. Now we watch, hoping to see the calf nurse so we know the calf will be healthy. 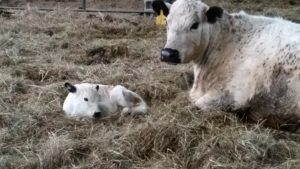 More to come… Well, the update is that the calf failed to nurse. She was clueless as to where the teat was. So we had to bottle feed her some colostrum, which she chugged down. Then we put Kit in the squeeze chute so we could handle her safely and milk her a bit to see if there was anything there. The calf did succeed in nursing a little, since we guided her mouth onto the teat. Two days later, after two more squeeze chute training sessions and a few intermittent bottles of milk, the little heifer has mastered her assignment and now nurses with high enthusiasm. It is a delight to watch her bouncing around in the barn and outside where the cows are eating hay.